Nagaland is India's mountainous tribal state located in northwest India. Nagaland is a northeastern Indian state that borders the states of Assam to its west and north, Arunachal Pradesh to its north, the country of Burma to its east and Manipur to its south. Kohima is the state capital here and the country’s area encompasses 6,401 square miles. In India’s 2011 census, the population here was found to be about 19,800,600 people, making it one of India’s least populated states. Some people say the state’s name comes from the Hindi word naga, which means naked, but the name could have also come from the Burmese version of word meaning people with pierced ears. Early man in this area was associated with the tribes in early Assam and Burma. Not a lot is known about the state’s history prior to the Burma’s invasion of the region in 1816, but it’s likely that the ancient culture and religion were similar to that of the Indus Valley Civilizations. Burma was in control of the region until 1826, when the British East India Tea Company began to take control of the region. In 1892, most of Nagaland was governed by the British. During this time period, missionaries converted most people in the state’s local tribes to Christianity. Britain recruited some tribesmen to fight alongside them in World War I. While in Europe, these soldiers realized the value in unification. When they returned home in 1918, they organized and formed the Naga nationalist movement, also referred to today as the insurgency. In 1944, World War II was going on and fighting occurred in this region. The famous Battle of Kohima was fought here where the Allied forces and Indian people prevented Japan from taking over positions in India. In 1947, India gained its independence from Britain, but the region was deemed a part of the state of Assam. 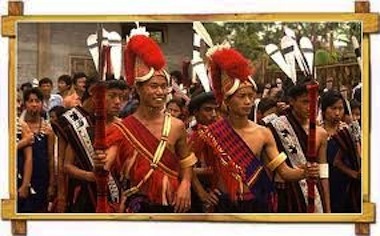 The Naga people rose and were determined to establish Nagaland as an independent state. The nationalist movement arose aggressively and created civil unrest to the point that the Indian Army was sent in to restore peace in 1955. After additional political unrest, including civil disobedience in the form of non-payment of taxes, Nagaland was finally recognized as a state on December 1, 1963. The state is mostly made up of mountains with Mount Saramati as its highest peak at 3,840 meters! The mountains of Naga are about 2,000 feet above sea level, where they originate in Assam, and they stretch out to the Brahmaputra Valley, where they are as high as 6,000 feet above sea level. The primary water resources for the state are the Doyang, Diphu, Barak and Chindwin Rivers. About twenty percent of the state is covered in forests. The climate of Nagaland is greatly influenced by its monsoons, which create a high level of humidity. The state gets between seventy and one-hundred inches of rain annually, which fall primarily in May through September and temperatures here range from as low as 39 degrees in the winter to 88 degrees Fahrenheit in the summer months. Nagaland is a tribal state where sixteen tribes make up the larger population; the Konyaks, Angamis, Aos, Lothas, and Sumis are the largest. Cultural crafts include weaving of colorful baskets and traditional shawls. People here produce shoulder bags, decorative spears, table mats, wood carvings, and bamboo works that they sell at markets and during festivals. Folk music and folk dance are an important part of the peoples’ culture here too. Tribal traditions are passed down through folk tales and songs that teach the people about topics such as love and the history of their people. Songs are even used to teach the youths about their farming and agriculture duties. Naga tribes celebrate their agriculture through festivals and these festivals are considered sacred. All tribes have their own festivals, but in order to gain unity in the state, Nagaland's government started the Hornbill Festival in 2000, which is a week long festival that begins December 7th of each year. The festival allows various tribal cultures to shine and show what characteristics make them similar and different to one another. The festival gets its name from the bird, which is mentioned a lot in tribal folklore. Participants enjoy live performances, arts, sports, food fairs, games, ceremonies, beauty contests, fire-eating and much more! Christianity is the most followed religion; more than ninety percent of the population is Christian. This is one of only three Indian states that has a Christian majority; the others are Meghalaya and Mizoram. Hinduism is practiced by about eight percent of the population and about two percent practice Islam. Each tribe in the state speaks its own language; there more than sixty dialects, but Nagaland declared English its official language in 1967. The state’s economy depends on agriculture. Rice, corn, tobacco, oil-seeds, sugarcane, potatoes and more are grown here! In fact, more than ninety percent of the population is employed in agriculture. Other important sources of income for the state are forestry, weaving, woodwork, pottery and tourism. Tourism would be a greater source of income than it is, but tourism is limited because the tribal insurgency has been active for the last five decades. Nagaland's GDP is roughly $1.5 billion. Over all, the state has a lot going on, but the tribal insurgency can create tension against the government, which makes it tougher for tourists to visit. If you intend to visit, it's wise to contact the state government before you travel to inquire whether you will need a protected area pass (PAP) to tour Nagaland. Leave Nagaland to visit the other states and union territories of India.